Les collections privées de l’Aspeg sont appelées depuis l’origine , »Musée de Pegasus Bridge ». 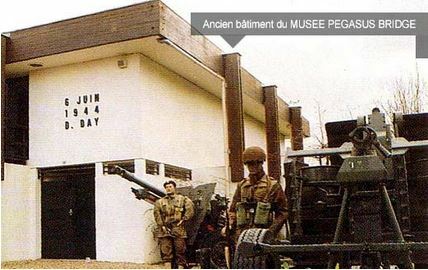 L’Ancien bâtiment du Musée de Pegasus Bridge a fermé mais les collections de l’Aspeg elles sont toujours vivantes et visibles. L'aspeg considère que ses collections dont elle a les titres de propriétés sont exploitées par des tiers de manière illegitime. Pour en savoir plus sur l’exploitation des collections de l’ASPEG, contactez nous! et soutenez notre action et les fondateurs de l’ASPEG, à l’initiative du tout premier musée. »Bénouville was the scene of the first – and possibly most vital – battle of the Allied invasion of Europe on « D-Day, June 6, 1944. From 12.15 am (British Double Summertime = 23:15 German/Middle-European time), a reinforced company of glider-borne troops from the 2nd Batt. Oxfordshire and Buckinghamshire Light Infantry, led by Major Reginald John Howard, landed around the bridge over the Caen Canal at Bénouville in three Horsa gliders and captured it from the Germans in a swift and dramatic attack. Control of this bridge was vital to the success of the whole Operation Overlord invasion because it would be the route of any German counter-attack against the seaborne forces which were due to start landing a few hours later on Sword Beach. At the same time, another Oxfordshire and Buckinghamshire glider-borne force of sixty men (one glider was wrongly released) captured the neighbouring bridge over the River Orne – about a quarter of a mile away near Ranville – which was also of vital strategic importance. The Caen Canal bridge was later renamed Pegasus Bridge by Royal Engineers, in honour of the winged horse symbol of the Airborne Forces, while the River Orne bridge was renamed Horsa Bridge, after the gliders which carried the men to war. As for the café, on D-Day itself Monsieur and Mme Gondrée who lived in the café were woken up by the landing of the gliders. Monsieur Gondrée looked out of a window and saw black masked troops running over the bridge, which he later learned were British paratroopers. In celebration he also dug up some 99 bottles of champagne which he had hidden in the garden and toasted his liberation with some of the men from the gliders. The Gondrées had three daughters and one of them, Arlette, took over the café from her parents and maintained it as a memorial to the men who landed on June 6, 1944. (Her picture is in the Holt’s Normandy Battlefield Guide Book published by Pen and Sword). To this day it also remains a working café. For many years after the war Major John Howard could be found in the café for the June 6 anniversary and even today many veterans and current members of the Airborne Forces still visit Gondrée Café or one of the other bars in the immediate vicinity »’.